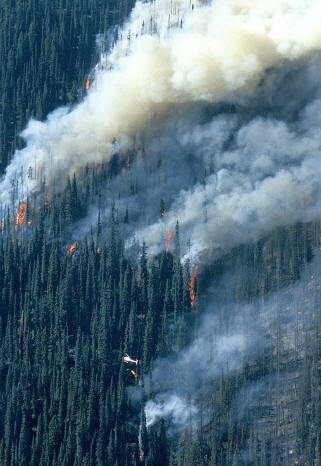 The widespread forest fires of the summer of 2003 reminded us of the destructive power of wildfires. In the southern interior of British Columbia, tens of thousands of people were evacuated and hundreds of homes were lost. In Mount Revelstoke and Glacier National Parks, twenty fires burned 1500 hectares and cost two million dollars to manage. We fear fire for good reason. But fire is more than just a destructive force of nature. As an agent of environmental change, large fires occur infrequently in the interior wet belt of British Columbia – but when it does, the effects are rapid and radical. Along with avalanches, diseases, insects, and windstorms, fire is an ecological process that shapes the forests in the Columbia Mountains. All these disturbances are natural and forests have ways to recover, even benefit, from what at first seems catastrophic. While trying to make sense of fire in our forests, I looked up the most famous proponent of forest fire safety— Smokey the Bear. Smokey is best known for one line, “Only you can prevent forest fires,” which is still the core of his message. Born from the worries of the Second World War when the able-bodied persons who normally would have been fire fighters were otherwise engaged, the United States government launched Smokey’s campaign as an effort to reduce human-caused fires. For decades Smokey’s message also implied that all wildfire is bad, that besides putting people and property at risk, fire killed animals and destroyed their habitat. “It wasn’t until the 1970’s that anyone in the United States Forest Service (where Smokey is still employed) considered fire as a possible necessity in an ecosystem— and those few guys were considered heretics,” Smokey admitted. Convection currents from the St. Cyr back burn sucked the wildfire into an already burned area. Fire history research shows that in Mount Revelstoke and Glacier National Parks 80% of fires are started by lightning, 9% started by the railway, and the remainder stared by people. Most fires are less than ten hectares in extent. Only 2% of fires are destructive on a large scale, accounting for 97% of the burned area. Parks Canada recognizes fire as a natural process and allows naturally occurring fires to burn unless there is a risk to people, to facilities, or to the fire spreading to adjacent lands across the park boundary, as was the potential this summer at St. Cyr Creek, north of Mount Revelstoke.Park fire crews fought the St. Cyr fire by lighting a back burn with a drip torch slung from a helicopter. The creation of an intense fire in this manner created a huge convection column. This air movement sucked the wildfire toward the back burn. It had the effect of eliminating the combustible materials between the wildfire and the rest of the valley, thus preventing the fire from reaching the Columbia valley where winds could have pushed it towards Revelstoke. Parks Canada managers are now considering to what extent fires will be controlled in order to protect caribou habitat as it is in decreasing supply across the region. The old, widely spaced stands that caribou require are normally more resistant to fire than second growth forests, which are comparatively densely stocked with trees. 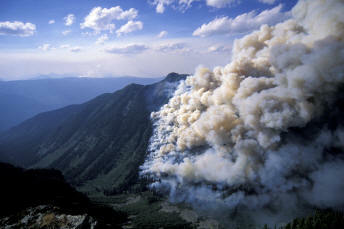 However, extreme fire conditions such as the summer of 2003 put even wet belt old growth forest at risk. Small fires may help protect caribou habitat by breaking the forest into a complex patchwork of different aged stands, less susceptible to burning all at once. So, we still heed Smokey’s message to some extent. Fire remains a potentially destructive force—one that cannot be eliminated in our forest, but one that may also have positive effects for some species. Look in Smokey Bear’s vault for radio clips with the “Smokey the Bear” theme song. Listen to interviews with Smokey and Roy Rogers, and other celebrities.